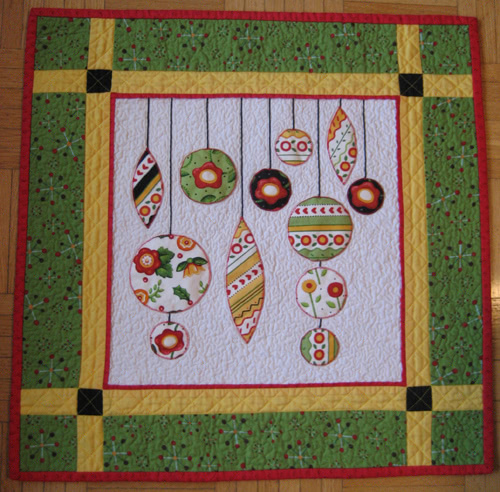 Christmas Ornaments Mini Quilt | Aiming for Accuracy Pattern Co.
Christmas Ornaments is a fusible appliqué quilt pattern. The finished project can be used as a wall hanging or table runner. It is very quick and easy to put together. 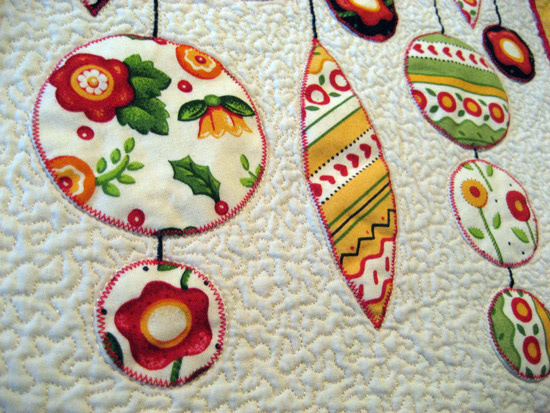 You can add embellishments if you like, such as buttons, cording, beads, etc. The pattern includes a detailed photo tutorial and a full-page pattern layout for tracing and placement of the appliqué shapes. Two (2) 7/8" strips red for the flange, sub-cut: four (4) 7/8" x 13"
Two (2) 1.5" strips yellow for the inner border, sub-cut: four (4) 1.5" x 12.5" and eight (8) 1.5" x 3"